Times like this make it worth it…..
Over time we as Professional Hunters enjoy the privilege of being part of something truly special. It often involves a once in a lifetime experience with mother-nature, a rare sighting of that monster that got away, or starting a hunt with a complete stranger and walking away as friends for life. 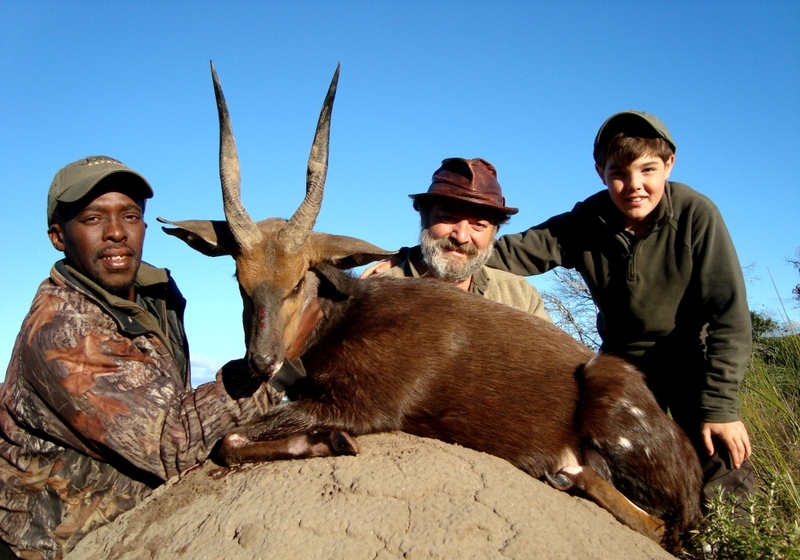 When comparing my short hunting career with guys like my Dad, Rick, and the many other great Professional Hunters of the industry, I consider myself extremely fortunate to have been a part of so many first time trips to Africa. 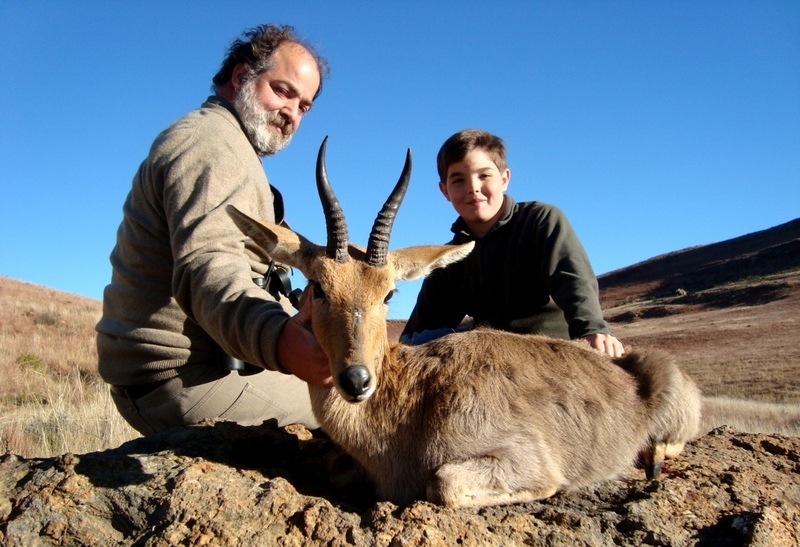 We all agree there’s no safari better than a young boy’s first African safari with his father. Late June saw Ignacio Gallardon and his son Inigo, board the late night flight from Madrid, Spain, bound for Johannesburg and finally onto Port Elizabeth. 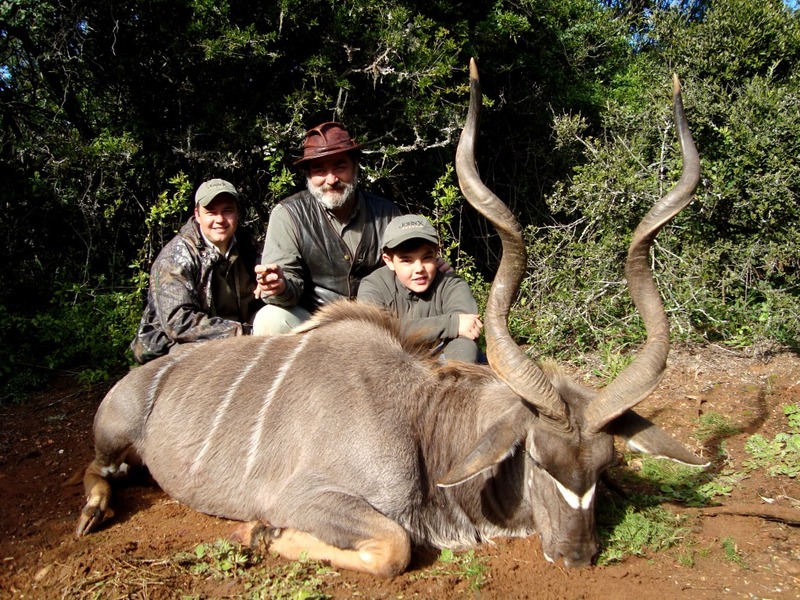 They would be joining Professional Hunter, Carl van Zijl, on safari in the Eastern Cape. Ignacio was after a few last remaining species he had not previously hunted on one of his many African hunts, and Inigo was simply in heaven. What more could one ask for than being on safari with your Dad in Africa! Carl was still on safari with celebrity, Mike Rogers, filming his new season of SCI Expedition Safari, when the Gallardon’s arrived. Gary helped out and brought Ignacio and Inigo as far as Cradock, where the hunters would split. We then continued north, finally arriving up at Ed’s place in the Stormberg Mountains. After checking the rifles, we decided to head out for an afternoon hunt. It was to be a great afternoon spotting numerous groups of both Vaal Rhebuck and Mountain Reedbuck. 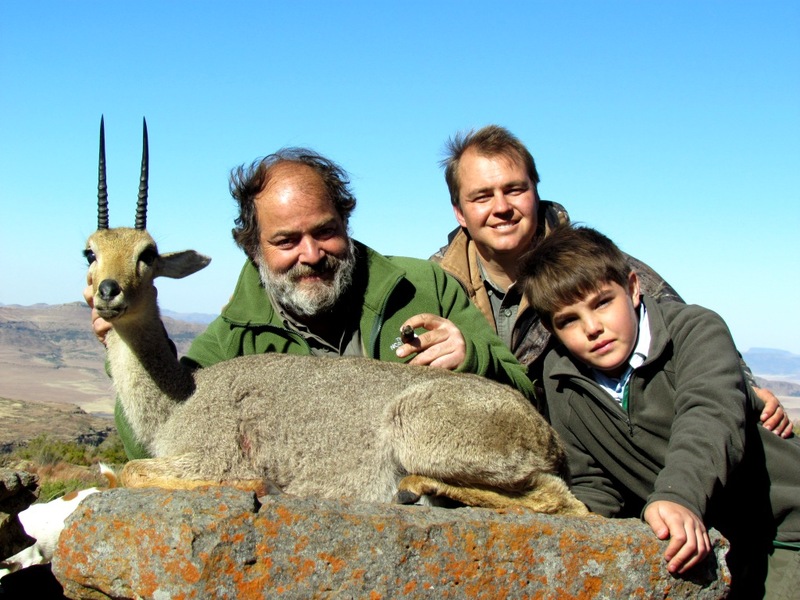 We finally settled on a lone Mountain Reedbuck ram resting on one of the upper ledges of the mountain. We took our time, the wind was not perfect, but we wanted to give it a go, after all this was to be Inigo’s first African trophy. We crested the last rise and there he was. Inigo settled into the prone position and squeezed off his shot. At the thump of the bullet the ram tumbled over and elation engulfed the entire hunting party! After so much excitement it was hard to get focused again. 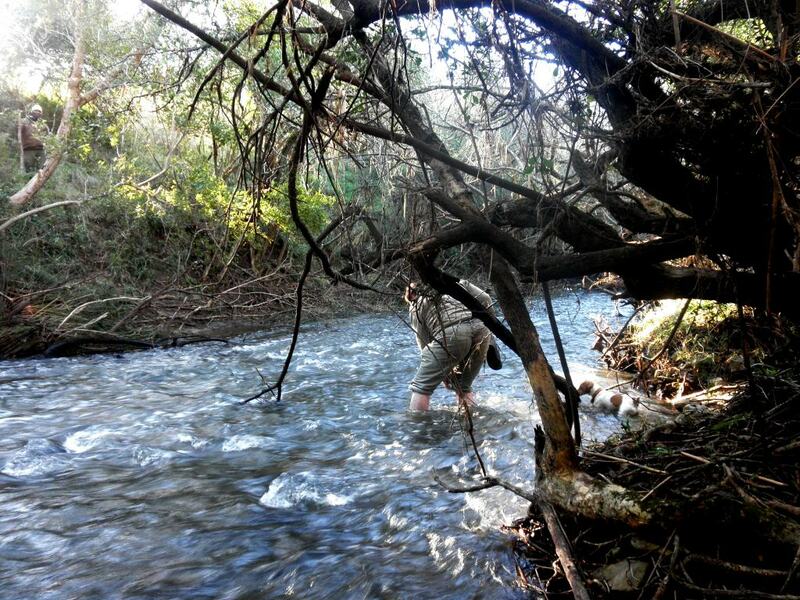 We were still in the mountains, still on the hunt for Vaal Rhebuck. We spotted a group late afternoon and moved in closer for a better look. A good ram was identified and we decided to have a go. The shot was long, longer than what we had anticipated and shooting conditions were tough with high winds picking up to gail force. We came up short and set off what was to be a marathon Vaal Rhebuck hunt. In hindsight, it proved to be the best thing. Had we got lucky that first afternoon, we would not have endured the hardship of the next three days or enjoyed the views from the many mountain tops we crested. Early on day three we finally got our chance. 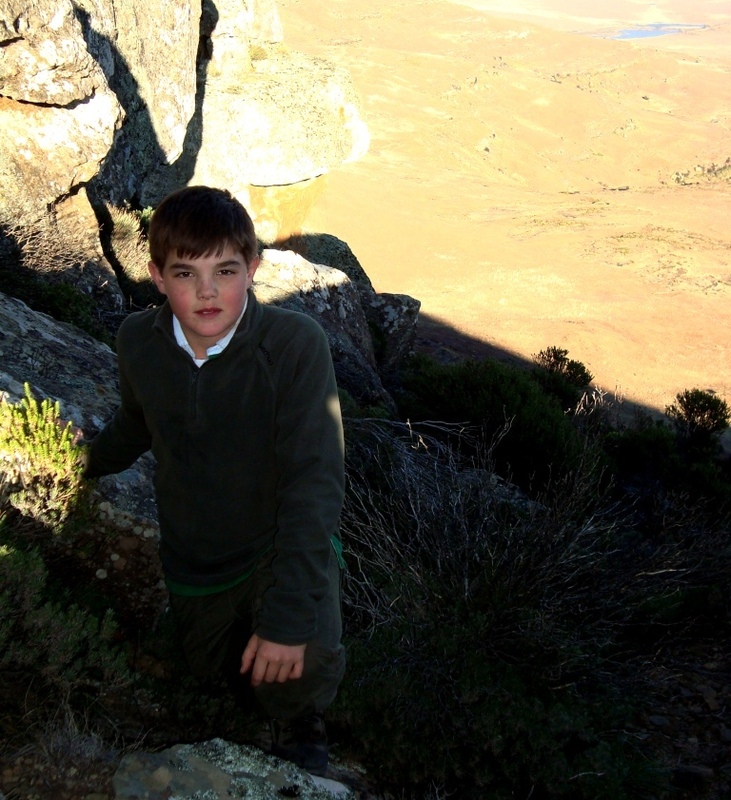 We had sent both Ed and our tracker, Boy, up one of the higher peaks in the vicinity to glass for Vaal Rhebuck . Within minutes they spotted a group 1500 yards below their position. The hunt was on. We decided that the long way around would be the hardest, but the safest. We had seen enough rear ends of Vaal Rhebuck disappear over hills in the previous 3 days to last a lifetime. No shortcuts – nothing was going to be left to chance. We had our spotters, the wind was perfect, and we were ready to hike. After 4 hours of walking, running, crawling, and Leopard crawling - we were finally in position. I edged along the cliff, trying not to look down, signaled to Inigo to wait at the base of the cliff, and for Ignacio to edge onto the ledge. He crested, spotted the ram, and took a snapshot. The ram stumbled forward and dropped. There was a sense of relief and great achievement, this one we had certainly earned. Having endured three grueling days of hunting the mountains, Ignacio decided that his son had earned the right to be spoiled for the remainder of the afternoon. A fine Black Wildebeest bull topped off the afternoon and a day filled with adventure and excitement. The following day we started our journey south, away from the cold and the mountains, straight into a raining coastal area. We made the best of the weather and decided to hunt for plains species instead of the forest dwellers. 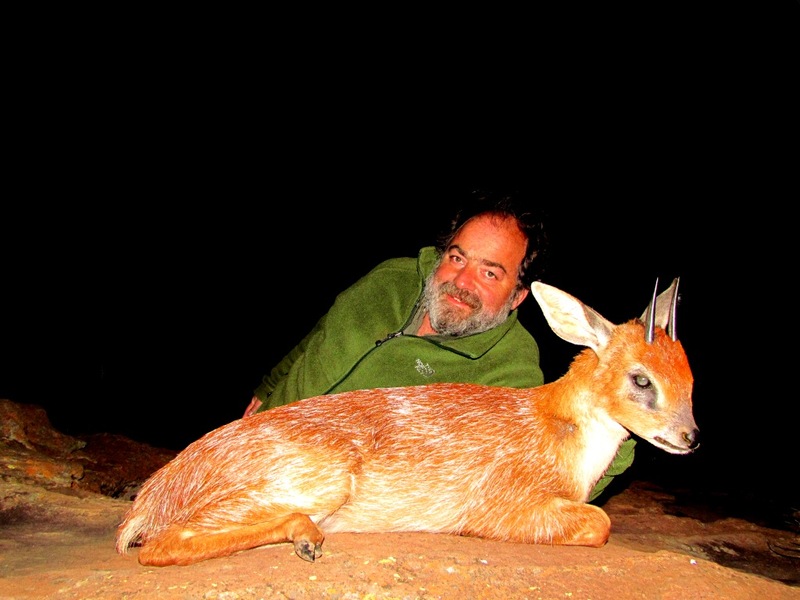 Inigo endured the bucketing rain and made a great shot to bag his first Gemsbuck. A super Gemsbuck bull. Day 5 saw us rising to overcast conditions without any wind. Just the kind of conditions we were after. I called up Jeff our hounds’ man and gave him the go ahead. Our plan was to head down towards the coast in search of Caracal. At first the dogs battled to locate any sign of tracks or scent. By 10am the weather had improved dramatically with sunny clearings filling rapidly with numerous species of game. We spotted a group of Kudu cows in a clearing below our glassing position. We watched them for a couple of hours, actually giving up hope of a bull stepping out right next to them. Just as we wanted to change our glassing position Inigo jumped up and waved us over. He had spotted the bull! We grabbed our gear and covered a quick 300 yards to get to within shooting range. Ignacio anchored the bull just as he was entering the thick bush; he spun around and disappeared into a wooded area. 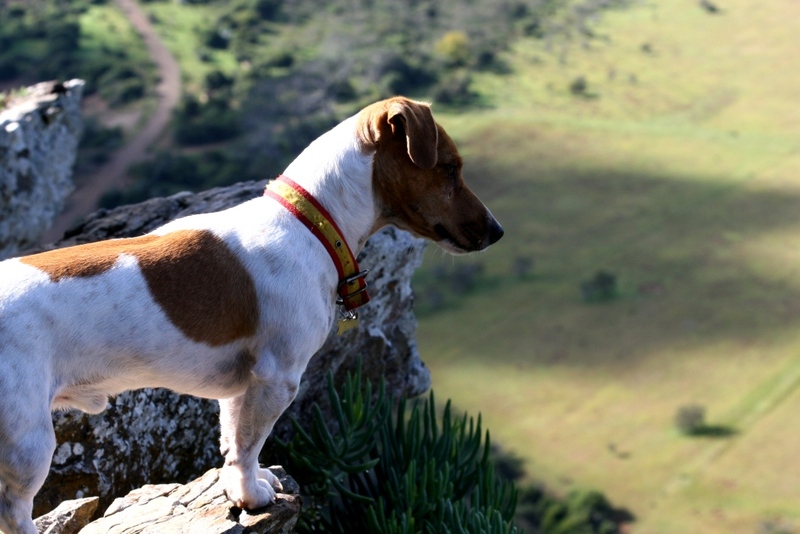 We called in our Jack Russel, Bongo, hoping to locate the bull as fast as possible. On our final approach to where we had last seen the bull, we spotted him again. This time Ignacio dropped him in his tracks. Ignacios’s East Cape Kudu was the very last Kudu sub species he had not hunted in Africa yet; a truly great feat when one considers the distribution pattern of the various sub species available to hunt. While we were having fun and games hunting Kudu, our hounds were hard at it chasing a Caracal in the neighboring valley. The cat had treed in a traitorous valley, lined by acres upon acres of dense coastal forest. We took our time, not wanting to spook the cat into jumping from its tree it had chosen to tree in. Ignacio made the shot with a 12 Gauge Shotgun using AAA shot. The cat stiffened at the shot and got stuck in the limb of the highest branch. It took serious agility and tree climbing skills from our tracker, Boy, to retrieve Ignacio’s Caracal. 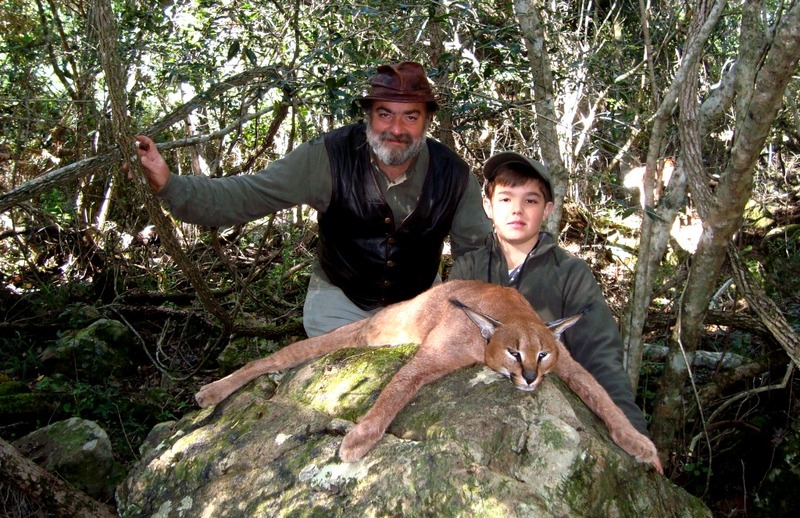 The Caracal turned out to be one of the biggest of the season. The fact that it was a male was the cherry on the cake! It goes without saying, we had a huge morning. Having hunted both an East Cape Kudu and a Caracal in the space of two hours, we had the remainder of the afternoon to concentrate on Cape Bushbuck. 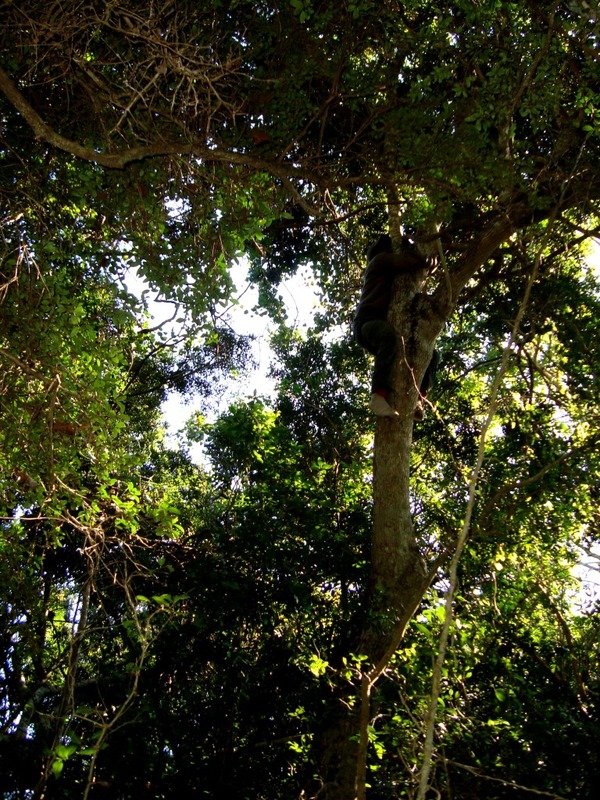 We looked hard searching for those weary old Bushbuck rams…. We finally spotted a ram late that afternoon and Ignacio decided to take the shot. As best as I could see he had hit the ram twice before disappearing into the undergrowth. With the quick fading light we decided to return first thing in the morning. What we hadn’t counted on was the water level rising in the river, making things a bit more complicated than anticipated. Bongo tried hard, but to no avail. After 5 hours we called off the search, the minimal blood had dried up 2 hours into the search and the remainder of the time was more or less a guessing game trying to track a particular track between a hundred others. A disappointed crew headed back towards camp, stunned at the fact that our luck had finally run out. While our safari had been blessed with unlimited bursts of luck, both Ignacio and Inigo had taken their chances, bagging a very high standard of trophies throughout. So when we drove from camp that second last evening in search of Cape Grysbuck, our spirits were understandably high, we were at the point of invincibility. Invincibility it turned out to be. 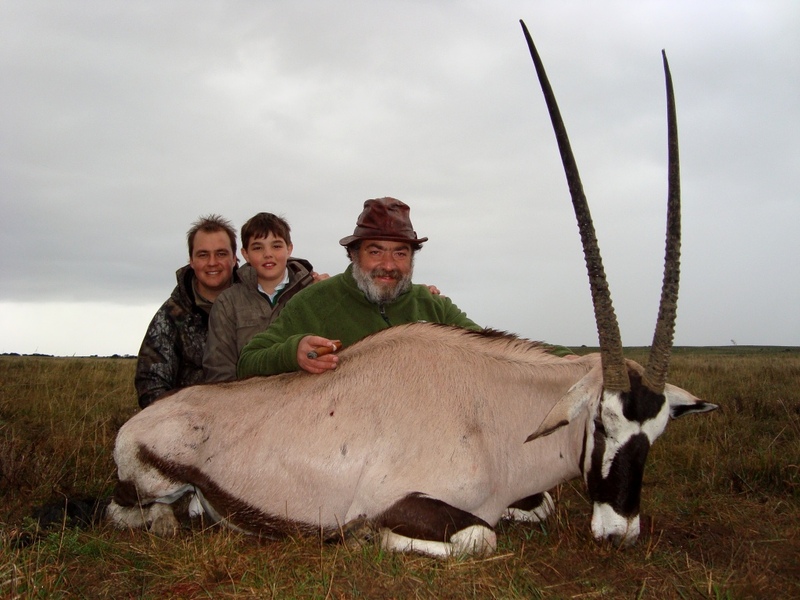 In all our years have we never seen nor hunted a Cape Grysbuck this big at John X Safaris. I seriously doubt one will stumble into similar ram very soon again. To put it in perspective, it was like bagging a 65’’ Kudu, yet the difference between this Grysbuck and a very good one is only 1 inch. Many a hunter would never notice or pay attention to a trophy of this nature. To the trained eye - it was striking gold. What made it so fantastic was that Ignacio realized what he had been blessed with, and truly appreciated the trophy as a major part of his “Tiny 10” collection. Trying to fall asleep that evening proved extremely difficult. With so much excitement from the nights hunt, and the thought of our last day fast approaching, set off a few unwanted nerves. 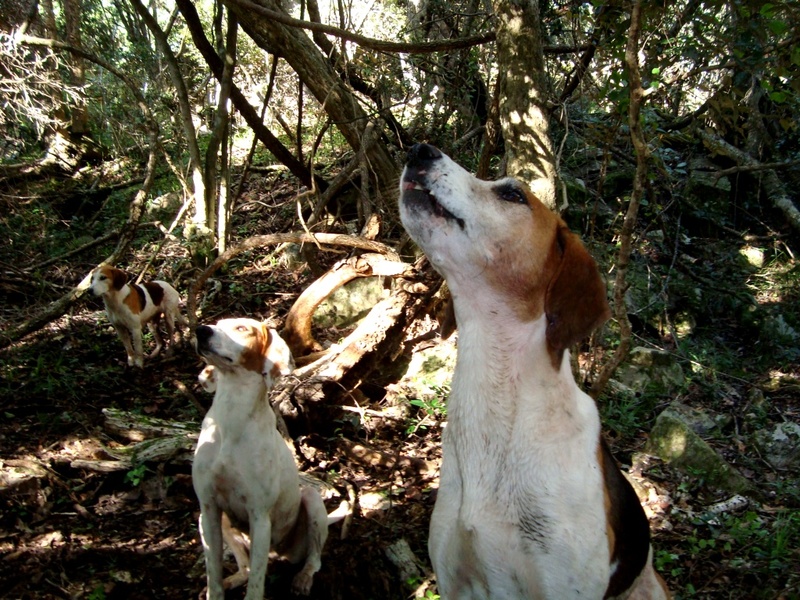 To understand the nerves, one must understand the Spanish hunter and his/her culture. A Warthog is the begining and the end of everything on any African safari. They spend their entire lives hunting Wild Boar in Spain, they dedicate every free minute to their addiction, always pushing for a bigger boar. So when they think about Africa, they think about pigs with massive tusks, Warthogs. 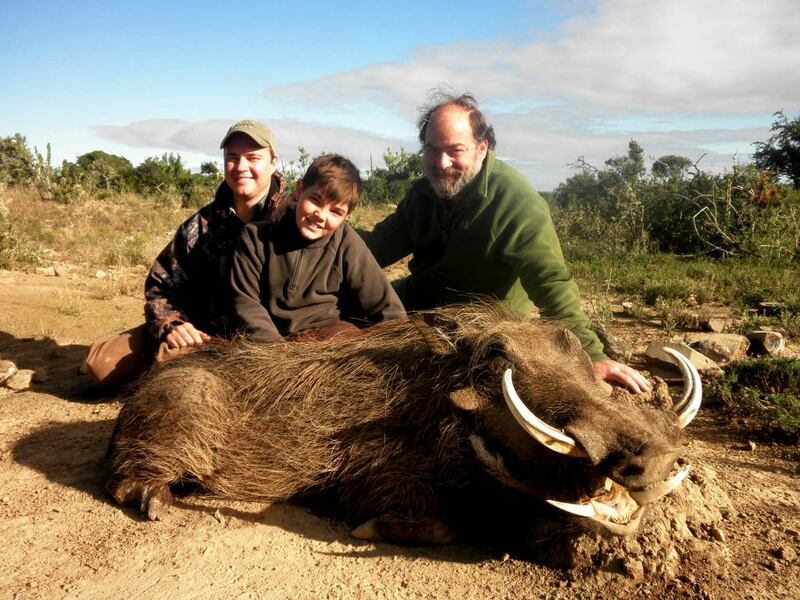 Our final day was upon us and I was not planning on sending a young Spanish hunter home without a Warthog on my watch. That last morning saw Warthogs everywhere. Boy once again turned out to be the champion spotter. I could clearly see his urge and desire to get this particular Warthog he had spotted. He understood what was at stake. Up to that point I had not seen the boar, only the sows feeding with him. He was feeding some ways from them, behind brush in the same clearing. There was no time to double-check. We got moving immediately and left Boy to keep an eye on the boar and direct us in. We got to within shooting range when suddenly another group of pigs appeared off to our right. Our hearts were stuck in our throats as the leading sow stopped and stared at us for what felt like an eternity. As she turned to feed away, we dropped out of sight and continued, edging our way ever closer. Once we found a suitable spot, we got set up and waited. First the sow passed, then nothing…. Where was the big boar? Suddenly we spotted him, moving into the clearing ahead of us, he stopped, smelled the sow, and Inigo stared at me with desperate eyes for the go ahead. I looked over at Ignacio, the excitement and angst was beyond description – here we were - everything was perfect. 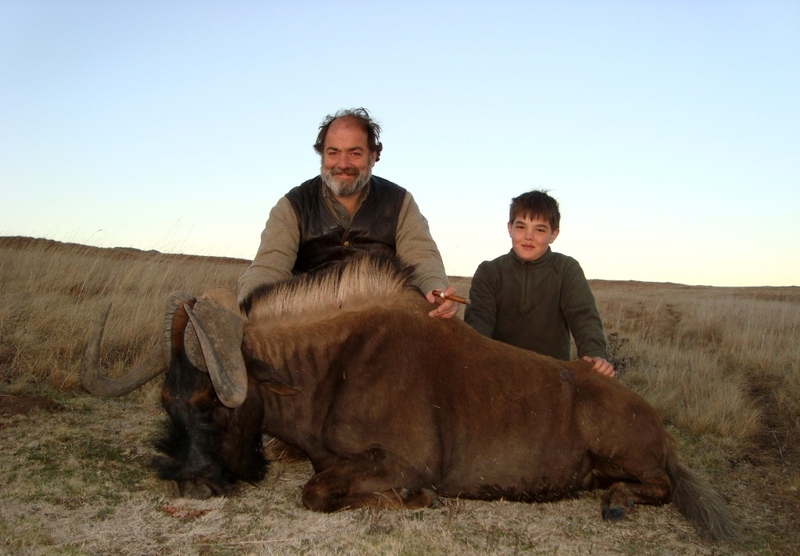 The stalk had been exciting, the set up on the tripod was solid, Inigo had his father along to share his first Warthog, Ignacio was blessed to have his son along doing the things he enjoyed most of all, and me? I was content to be a part of something truly special…..